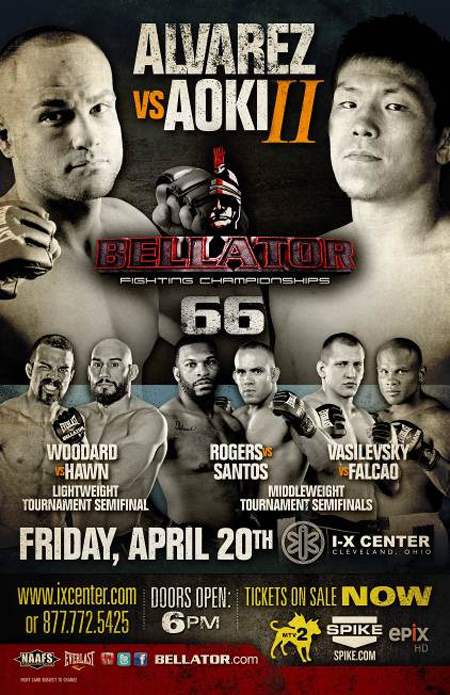 The 11-bout lineup for “Bellator 66: Alvarez vs. Aoki II” has been finalized. The show features a lightweight rematch between Eddie Alvarez and Shinya Aoki. Aoki caught Alvarez in a vicious heel hook in their initially meeting in December of 2008. Since getting demolished by Gilbert Melendez at “Strikeforce: Nashville” in April 2010, the submission specialist has rattled off seven consecutive victories. Alvarez is fresh off losing his title to Michael Chandler. “The Silent Assassin” was perfect through his prior seven contests before the November upset defeat. Additionally, the semifinals of the Season 6 Middleweight and Lightweight Tournaments will take place in the April 20th event. I-X Center in Cleveland, Ohio hosts the festivities. Spike.com will stream the preliminary fights live starting at 7PM ET/4PM PT. MTV2 broadcasts the main card at 8PM ET/PT.